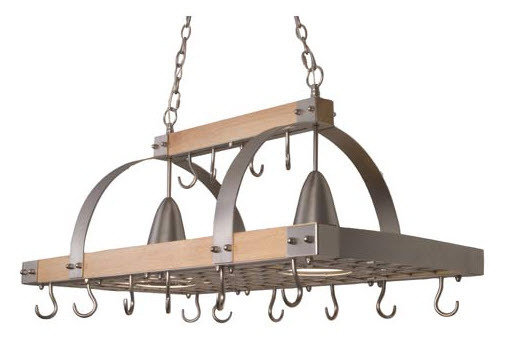 "I haven't been able to find this information on your blog, but I am new to it - any suggestions or taboos for hanging a pot rack in a semi open concept Kit, DR, LR area? I love the idea, and had a wrought iron rack custom made for my copper pots, but now I think maybe it will look cluttered." 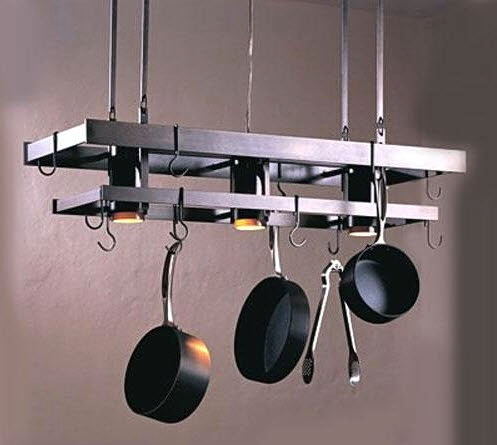 BellacorSure, there may be some pros and cons as well as ideas and suggestions about the best way to display a pot rack in your situation, or if it even should be displayed. Better yet is to do this: Be flexible. In this case, we are not talking about a permanent fixture or design element that truly is a decision which you may have to live with for many years to come. I highly recommend that, especially since it is custom made, you hang it where you originally felt it should be. There is no right or wrong answer...the answer is do you perceive "clutter" as a negative or do you perceive it as visually interesting, a positive? Live with it. If you find you don't like it, I would chalk it up to a minor error in judgment. The point is, don't think of this as a decision one way or the other forevermore. If it works out, great...if it doesn't, go to plan B. So often decisions like these are looked at as permanent. Give yourself room to try it. Of course, if you were planning on having pendants or other lighting fixtures in place of the pot rack, then here's what I would do. I would have the wires run into the ceiling in the general area with enough slack so that they are in place if you decide you do not want the pot rack. A licensed electrician will advise you as to the proper code involved, I cannot do that, but most likely, you should be able to have wiring in place. Not the most inexpensive solution, but if you are indecisive on this issue, this may help. Hubbardton ForgeThat said, some time could be spent on considering what types of items, decorative or functional, might look interesting visually. Maybe the pot rack serves a purpose to hold decorative items only. Take time...lots and lots of time to explore a wide variety of items which will result in some very different looks. I like to change decorative arrangements in my home on a fairly frequent basis, at least a few times a year. It takes time to create an arrangement that really "speaks" to me. Once it speaks to me, you know it...and then, take a photo of it and if you want to keep changing around the pieces, you'll have a record of an option that worked. This will take time, but be open creatively and the possibilities will reveal themselves to you. One more thing...if You are unsure, it's quite possible that part of you likes it up and another part does not. Keep it up for part of the year, then take it down. That is living flexibly and living flexibly is FREEDOM!